You never know what you might find when you publish a book. It appears the folks at Shifting-Paradigms.com like my book, “The Intrepid Way”. 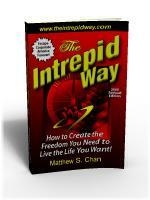 Matthew Chan does an incredible job of sharing his life changing experiences in The Intrepid Way. A specific guide that recounts his personal development of a passive income lifestyle. The book simply relays a practical illustration of what passive income is, how it can be achieved, and what benefits Chan has gained as a result of this dramatic life change. The perfect primer for those seeking a better way to make a living. I thank them for recommending my book to others as a valuable resource.